System-5 is for more heavy frames. The system is without adjuster and no parts are connected to the frame. 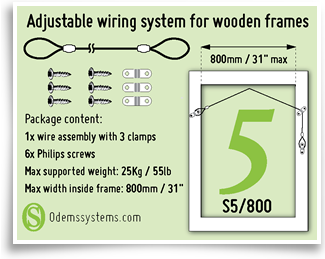 The system is available in 5 lengths and all systems are single packed, including the inlay, screws and clamps. It covers wooden frames/mirrors from (glassdimension) 800 mm - 1800 mm / 31 1/2" - 70 3/4".